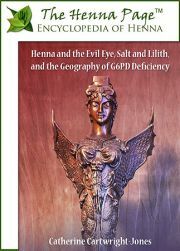 Traditions of averting malevolent spirits with henna and salt to may have altered the incidence of Glucose-6-phosphate dehydrogenase deficiency in populations across the North Africa, the Levant, and the Arabian Peninsula. Recently, physicians have found that G6PD deficient neonates and young children, particularly males, who have been hennaed according to local blessing and curing traditions in Turkish and Bedouin Muslim cultures, suffer hyperbilirubinemia and acute hemolytic crisis. In Jewish traditions in the same regions, children were traditionally rubbed with salt rather than henna. This paper was written in partial fulfillment of requirements for PhD studies, under advisor Dr. J Tyner PhD, Geography Department, Kent State University, 2008. Amla is an effective exfoliant. A paste of amla can be used to gently remove skin cells dried out by winter weather. Ancient Sunrise® and Becoming Moonlight® products from www.Mehandi.com make great gifts for a variety of people. You might know someone who has been interested in trying henna, or someone who has been a devoted henna-head for years. Maybe you have a cosmetics-lover in the family, an artist, a frequent flyer, or someone who is always busy but wants to look their best. Here are eight gift ideas to make everyone happy. Hennaed hair is stronger, smoother, shinier, and has lasting color. Because of its many beneficial properties, henna (lawsonia inermis) has been used not only on the hair but on many parts of the body for various purposes since possibly as early as 1700 BCE.